This morning, I checked on the kiln to make sure the firing completed. It did fine, and is cooling nicely. Then I headed out for Pollocksville, which is about 15 miles south of New Bern on Hwy. 17. Today was the 4th Annual Eastern North Carolina Pottery Festival, organized by potter Rich Daniels. I wasn’t sure what to expect, but was pleased to see cars lined up on both sides of the road, and filling an adjacent field. The festival was held on the grounds of the Hughes Plantation, a beautiful old NC home which probably has some great stories to tell. Potters filled the yard surrounding the house. The festival was announced in the Kinston Free Press, which said there would be 30 potters in attendance. I didn’t count, but I believe it. There are all kinds of things to see. From some beautiful, huge red jars by a potter from the Simpson area, to some tiny pieces by a New Bern potter, and everything you could imagine in between. Fantastic variety of forms, surface treatments and glazes. I had so much fun, I forgot to take pictures. 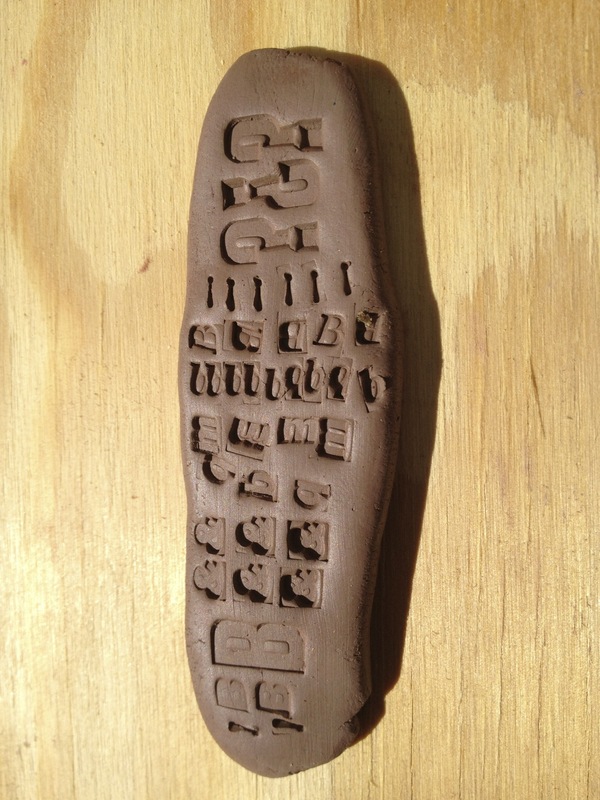 Lead type impressions in clay. Trying out samples from Courtesy Press. The smaller look like about 12pt type. The larger are about 24pt. Not sure of the faces. On the way out of town, I found the printing shop, Courtesy Press, and got to spend a few minutes with Josh and April. We talked about printing some posh cards for Barley Hollow, and somehow got onto lead type. They were quite generous and sent a few pieces home with me to play with. They work great in clay. I’m going to try some texturing and patterns in the next series of work. Thanks for the great visit! If you’re in Pollocksville, check them out at 127 Main Street, right in the heart of downtown. As the window notes, they’re available by appointment or chance. All in all, the trip to Pollocksville for the Eastern NC Pottery Festival was well worth the trip. The offering was every bit as interesting as anything you’ll find anywhere else in NC, and distinctively different enough to make the visit worth planning. Rich says the festival will be held on the 2nd weekend in April as long as he’s got he energy to make it happen. I hope that’s a long, long time. Thanks to all the potters who showed up. I’m thrilled to know there are so many of us east of I-95. Put it on your calendar for next year. I know I will.